If you have back pain, it’s no fun. 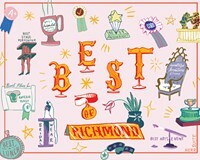 Fortunately, Richmond has numerous massage therapists — including winner Spinal Correction Center, which also offers chiropractic care and special treatments for pregnant women, children and auto accident survivors. Deep-tissue and Thai massages are good for working out kinks, and the center’s monthly membership is a money saver if you’re the type who wants, or needs, a regular massage.